The sales team is one of the most vital parts of any organization. They are responsible for a lot of things, such as fetch revenue for the business, increase brand value, establish sustaining a relationship with clients, and be the first point of contact between the internal management and customer. A business cannot prosper if the marketing and sales team lacks productivity loses interest. Therefore, developing businesses and start-ups need to adapt and implement business utility and productivity apps into their sales and marketing models. Most often, it is found that in order to balance both primary duties, such as bring in more clients, and secondary obligations, such as communication and administration, the sales team ends up not accomplishing their goals, which leaves them with unfulfilled targets and poor time management strategies. Organizations today must need some kind of reinforcement models that will help their sales force to eliminate redundant tasks and improve their performances. 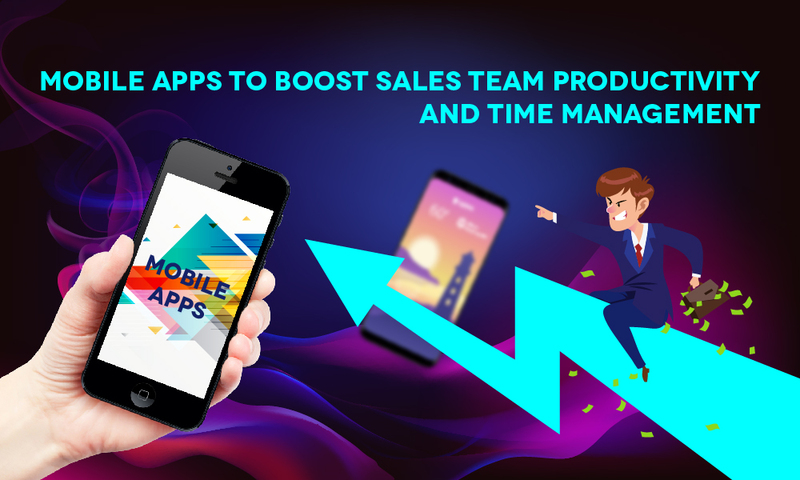 Mobile applications bring so many unexplored opportunities for the sales team to make more sales, improve efficiency, and increase selling time for each sale personnel. Access to accurate and immediate information, experiencing and inculcating seamless communication, and projecting a dynamic and clearer picture of products and services to potential clients can be enhanced and tailored to suit organization requirements through mobile applications. By implementing automation in sales, the time, effort, and skill wasted on manual work, such as data entry that leads to data error, can also be reduced. Mobile applications enable sales personnel to have access to comprehensive information about their work, their to-do activities of the day, and the information needed to function at the tip of their fingertips. Customized mobile applications provide marketing executives with information on the retailer, manufacturer, or distribution dug out from the company’s integrated CRM. Automation also lets representatives track their own as well as external resources’activities, such as distance, time, travel, delivery, and transportation. Quick and comprehensive access to data allows the sales force to have greater knowledge about the client, in terms of history, payment status, customer ratings, projects implemented, products ordered and so on. With complete information, executives can prepare themselves better for pitching their products and services to prospects. Automation of sales force enables the marketing team to feed details and client information digitally and retrieve them from the cloud when and as needed. Mobile applications and the availability of information as ERP data remove traditional approach to data storage and sharing. Automation of the workflow process of the sales team through mobile app solution leads to cent percent accuracy in project/service/product delivery time. Reps will be able to send workflow processes to clients for their approval before the project is started. ERP system allows the sales team to store data to process when required. This promotes on-time delivery, better customer engagement, improved status updates back and forth, and proactive post-delivery service. When it comes to client interaction, mobile applications can be extremely useful with regards to making an interactive sales presentation, building and sending proposals, and connecting with clients at a personal level. Sales reps can design their presentation with interactive apps instead of using the traditional PPT models and make each meeting more engaging. When it comes to making proposals, it is important that executives are alert and attentive in noting down requirements and ideas. Customized mobile applications and tools can help them to create proposals on the go, which in return help them to close deals faster and increase efficiency in offering competitive prices. Sales reps can use their smartphones in more numbers of ways than they could imagine. Integrating a CRM system to smartphone boosts work clarity and quality. You could also eliminate carrying laptops everywhere if you have everything functional in a smartphone. More innovative ways are coming this year, number one being wearable technology. They will have a huge impact and sales representatives will be able to customize more apps using the technology. We conclude by stating: with the advent of smart technology, you just need one mobile application to change the dynamics of the sales force. From keeping clients informed and boosting sales, to improved loyalty and trust, one can leverage mobile apps as a powerful marketing tool. The cost of development is very small compared to the payoffs you would receive in the future. A mobile can work as a promotional channel, business catalog, product/service information page, online shop, client base and a doorway for new opportunities and collaborations. If you want to know in what ways you can leverage the power of technology through mobile applications for your sales team development, contact us for a free consultation.